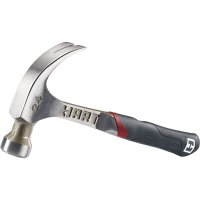 Maximise your hammer strike with the 21oz Framing Hammer (GEN 2) from HART. Forged as one solid piece of steel that runs through a durable grip, you have high control – with a grip 5 times better than conventional molding bars. And with an optimised Strikezone, you get the strongest hit with minimised glancing blows. The design is also optimised for quick and clean nail removals. With 3 nail slots, you’re equipped for extracting even the toughest nails. While the rip claw allows for quick applications with minimal wood damage, the 180° side nail pull is ready for deeply embedded nails. You can find the HART 21oz Framing Hammer GEN 2 at your local Bunnings today. 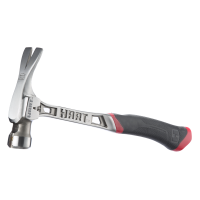 Bring highly controlled impacts to any application with the HART 24oz claw hammer. With a one piece forged steel design, its strength and durability ensure a long life of hard striking. The head of the hammer is high-quality tempered steel, perfectly balanced, and features an angled face to guarantee a higher surface area on impact. For extended hammering, the DuraGrip enables user comfort by absorbing vibrations, reducing shock by up to 50%. Its unique handle also provides high-quality comfort and manoeuvrability. You can find this HART curved claw hammer at your local Bunnings today. The longer handle on Hart's Steel Framing Hammer increases swing velocity, resulting in greater energy delivery, whilst reducing user fatigue. The HART 560g steel claw hammer delivers powerful striking force. Its forged steel construction and ergonomic features allow for maximum control, so you can hammer with precision and comfort on heavy-duty jobs.